Sodium Laureth Sulfate, Glycerin, Castor Oil, Parfum/Fragrance, Sodium Chloride, Mel/Honey/Miel, Sodium Benzoate, Citric Acid, Olive Fruit Oil, etc. Packed with skin-softening oleic acid, olive oil has been used for centuries throughout the Mediterranean as a moisturizer. Legend has it that athletes in ancient Greece would rub olive oil onto their bodies. Olives are generally popular for their skin conditioning and nourishing properties. So a shower gel made using olives not only cleanses the skin, but also moisturizes it. 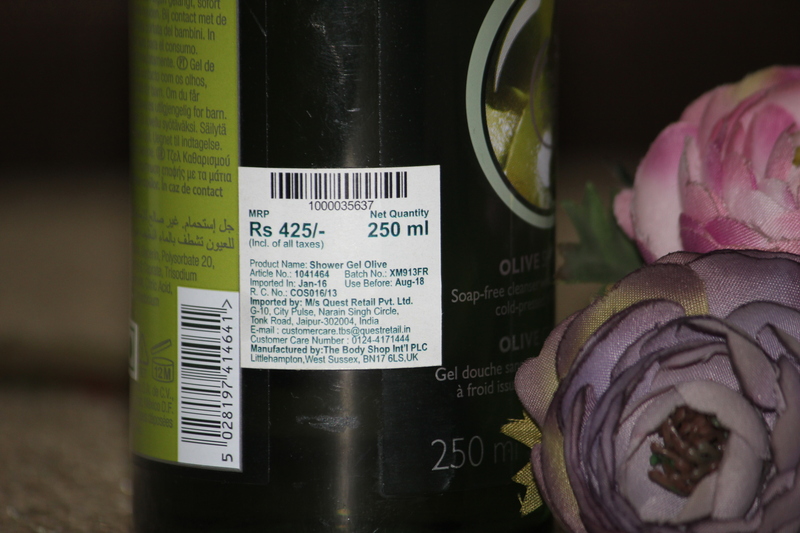 The Body Shop Olive Shower Gel (Rs. 425 for 250 ml) is a decadent way to nourish your skin in the shower. It is a soap-free gel that leaves your skin feeling soft and fresh with a brisk ‘green’ scent. The difference between a body wash and a shower gel is the consistency. A shower gel has a more gel-like consistency. 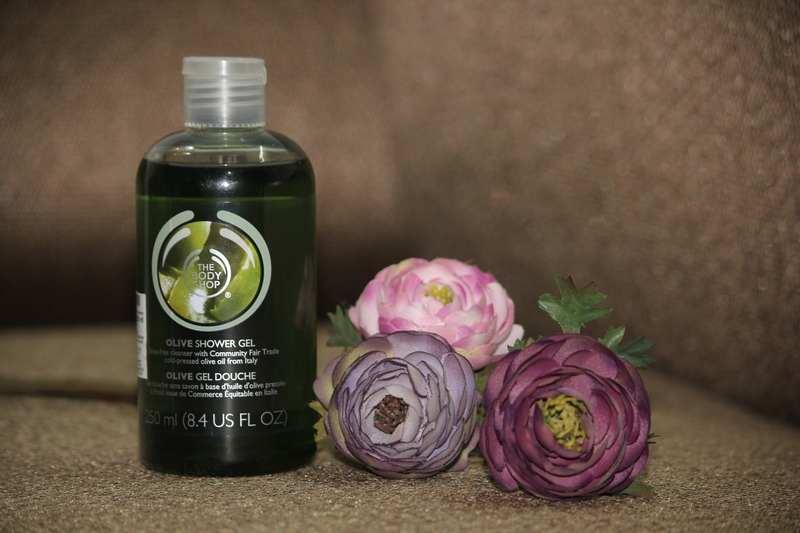 The Body Shop Olive Shower Gel is an emerald green colored gel that has a more runny consistency. 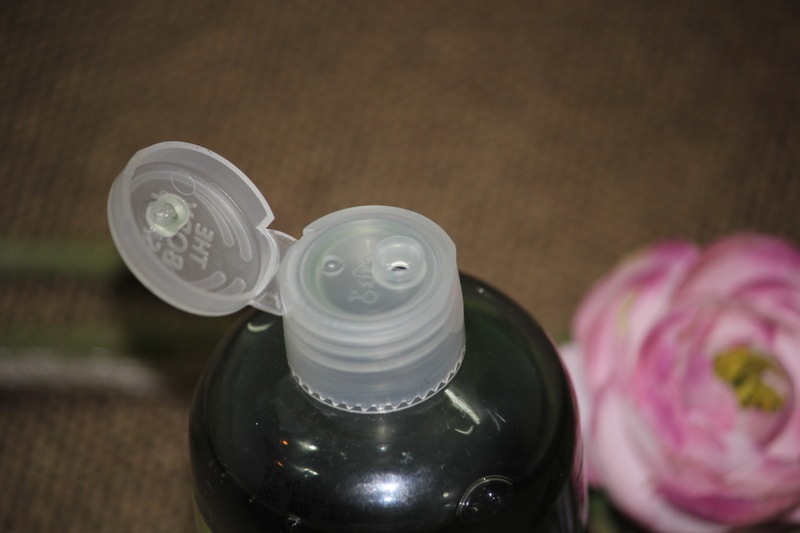 So the flip-open cap with a narrow nozzle is good to regulate the amount of product that you apply on your skin. The fragrance of the product was the first thing that attracted me to it. The smell can best be described as walking in an olive orchard right after the rains – it is the smell of wet earth after the first rains – to which some sort of extra freshness has been added. Trust me – you have not smelt anything like this before! But unfortunately, the smell is not long-lasting and stays for maximum an hour after the shower, what a bummer! I so wish the lovely scent stayed on – I wouldn’t even use perfume if the scent had longevity. The product lathers very well – so it does a thorough clean-up on the skin. A little goes a long way. Don’t get excited and pour on a lot of the product because you may feel you are using more water to wash it off. If you are using on a wet loofah, even better – you will probably need only a pea-sized amount. Yes – that little only! 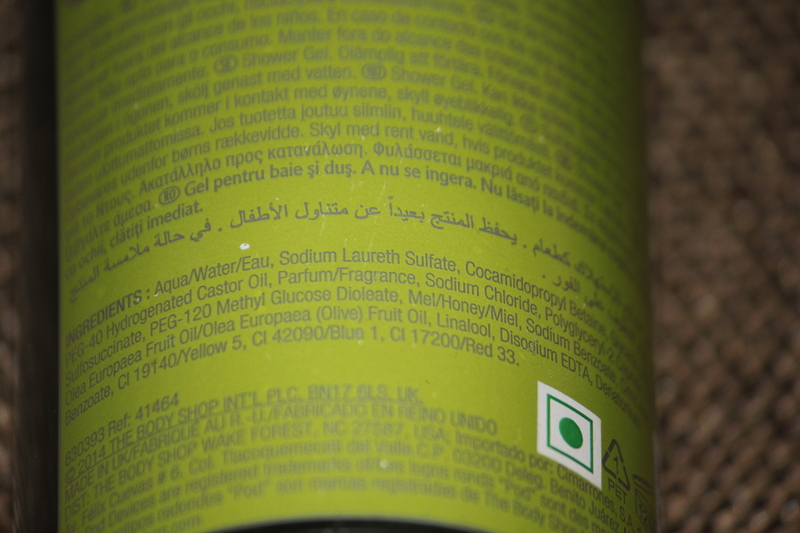 The Body Shop Olive Shower Gel was very gentle on the skin and did not cause any itching or dryness. My legs, which are perpetually dry, itched like crazy with most other shower gels, but not with this one. I use this shower gel almost every morning and I have noticed a slight improvement in skin texture as well. I have very dry skin so I need to bathe myself in lotion after a bath. But with this product, I am using less of the moisturizer or body oil. Use a wash cloth or loofah to spread the shower gel on your body for gentle exfoliation.